Objective: To determine in-hospital mortality and major adverse cardiac events (MACE) in acute coronary syndrome (AMI) patients with underlying severe chronic kidney disease (CKD) undergoing percutaneous coronary intervention (PCI). 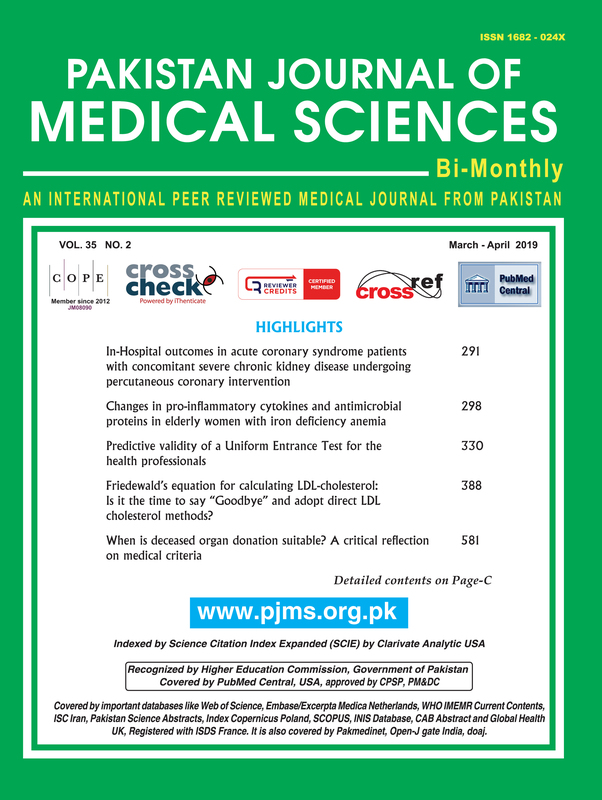 Methods: We conducted a retrospective cohort study from June’2013-December’2017 at Tabba Heart Institute, Karachi. Data was drawn from institutes’ database modeled after US National Cardiovascular data CathPCI registry. All AMI (STEMI: ST-elevation myocardial infarction and NSTEMI: non-ST-elevation myocardial infarction) patients undergoing PCI with creatinine clearance <30ml/min or ESRD on hemodialysis were included in the study. Results: During 54 months study period, 160 severe CKD patients underwent PCI. Mean age was 62.9±12.2 years. Men were 61.9%, hypertensive (81.3%) and diabetic (63.8%). Excluding dialysis patients, Creatinine clearance was 21.1±6.6ml/min/1.73m2. STEMI were 46.9% and 61.9% were Killip I. Mean SYNTAX score was 16.6±7.3. MACE occurred in 32.5% patients, of which 6(11.5%) had new hemodialysis and mortality: 17.5% were deceased. MACE predictor were cardiogenic shock (OR: 2.81, 95%CI: 1.17-6.74) and prior heart failure (OR: 6.84, 95%CI: 1.39-33.74), Predictor of mortality was cardiogenic shock or cardiac arrest (OR: 7.90, 95%CI: 2.95-21.17). Conclusion: Severe CKD patients undergoing PCI for AMI have drastically poor outcomes therefore individualization and patient-centric care management is mandatory.